President David Granger said, last evening, that Guyana attaches great importance to the relationship it shares with the United States of America. This relationship has led to bilateral cooperation in economic development, education, entrepreneurship, justice-improvement, and defence and security cooperation. The two countries established formal diplomatic ties on August 15, 1966. 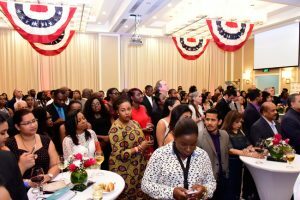 The President was at the time speaking at a ceremony at the Marriott Hotel Guyana to celebrate the 242nd Independence anniversary of the United States. That anniversary date is July 4. “Guyana and the United States enjoy cooperation under the Caribbean Basin Security Initiative. We look forward to deepening and widening this cooperation under a Multi-Year Strategy to Increase the Security, Prosperity, and well-being of the People of the United States and the Caribbean. “Guyana iterates its acknowledgement and appreciation of the United States’ leadership in disaster preparedness and emergency response assistance,” President Granger said. President Granger noted that Guyana’s Civil Defence Commission has benefitted immensely, particularly from the provision of equipment, machinery and training. The USA, he said, indeed, has been a friend in need. “The catastrophic 2017 Caribbean hurricane season confirmed how destructive are the threats posed by extreme weather events to mainland America and to the small-island developing and low-lying coastal states of the Caribbean. “Guyana looks forward to collaborating with the USA and other mainland states to mitigate the harmful effects of global warming and to provide relief to the victims of hurricanes and other natural disasters,” the Head of State noted. US Ambassador to Guyana, Mr. Perry Holloway, said that the United States will continue to lend assistance to Guyana where necessary to enhance cooperation and strengthen the bilateral ties which exist. 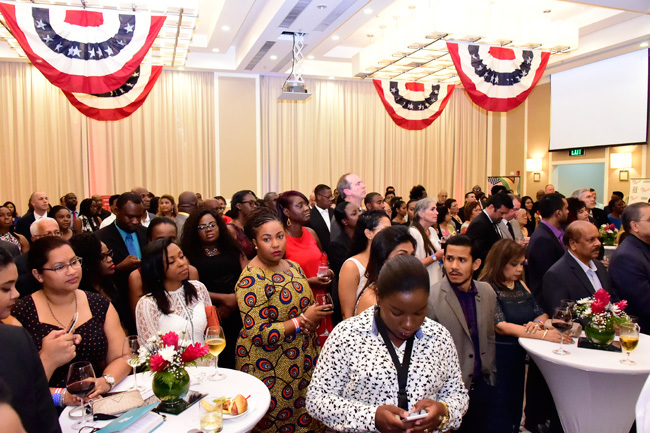 He announced that the first ever American Chamber of Commerce will be established in Guyana in August to cater for enhanced trade and investment. He noted that in spite of all the negative press, the angst and the uncertainty, Guyana’s future is brighter than ever before with the discovery of oil offshore. As the Government takes up the challenge of putting the appropriate systems in place to manage the sector, Mr. Holloway said that every Guyanese must also become involved in the process, particularly by educating themselves on the sector.